This monthly feature profiles a plan included in Planning for All New Yorkers: An Atlas of Community-Based Plans in New York City, an interactive, online tool created by the Municipal Art Society and the Community-Based Planning Task Force. This month, we feature the Rockaway Waterfront Park Plan for Seagirt Beach, spearheaded by Jeanne DuPont, Executive Director of the Rockaway Waterfront Alliance and winner of the 2008 Yolanda Garcia Community Planner Award. Nominations for the 2009 Yolanda Garcia award will be open soon! Far Rockaway, Queens consists of two square miles of barrier island just across the bay from JFK Airport and just west of the Nassau County line. Its population is diverse, including a large Orthodox Jewish community, and immigrants from Russia, Jamaica, Guyana, and Guatemala. While there are some upscale areas, particularly near the Long Island border, a large percentage of residents live in public or rent-regulated housing. The area has been hit hard recently by a double-whammy: a wave of foreclosures due to the ongoing mortgage crisis, and a nearly simultaneous wave of new, often luxury, development. Jeanne DuPont was inspired to start the Rockaway Waterfront Alliance (RWA) when she saw that much of that new development was proceeding with little regard for current residents. 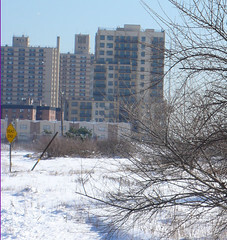 With a little research and coordination with the Department of City Planning, she also found that quite a bit of land in Far Rockaway reserved for public park space was either abandoned or neglected. In 2005, RWA created a proposal for a Rockaway Waterfront Park at one such neglected site, Seagirt Beach (pictured above). Located east of the Arverne Urban Renewal Area and just outside of Arverne-by-the-Sea (which has its own community-based plan in the Atlas), this area currently has no public playground in over fifty blocks along Atlantic Ocean side of the Rockaway Peninsula. The area was once a rich habitat for dolphins, striped bass, sharks, whales, and shellfish; however, dredging by the US Army Corps of Engineers to replenish the beach west of 32nd Street depleted its natural resources. RWA hosted numerous workshops for Rockaway residents and local youth to participate in brainstorming sessions to plan, design and raise awareness of the Seagirt Beach site. The organization’s goal is to create a public area out of these neglected lots that fits in with the natural landscape of the Rockaway waterfront, and allows the public to participate in the waterfront through educational, arts and cultural events. In May 2007, Mayor Michael Bloomberg designated $40 million to establish a public park at Seagirt Beach as part of his PlaNYC 2030 initiative. However, the process is “moving very slowly,” according to DuPont. The park has yet to be officially established, and local residents fear that the economic crisis could threaten the plan. In the meantime, RWA has released an Action Plan for Enhanced Waterfront Park Management, to address the following issues: inaccessible beaches and blocked waterfront access; illegal dumping of trash; and the uneven distribution of trash cans, lifeguards, maintenance, and public facilities along the waterfront. Their current goal is to create a community-led, youth-focused conservation corps and to raise funds to ensure adequate public safety, maintenance and programming for the Rockaway Waterfront. They recently achieved a major victory when the City selected RWA to develop the Rockaway Firehouse into a community center, which will focus on environmental programming. For more details on RWA’s Waterfront Park proposal for Seagirt Beach, please visit the Atlas of Community-Based Plans, where you can download a detailed summary.